Night time is the right time to catch an insect nymph carrying out that obligatory arthropod task - shedding its skin so it can continue to grow. By necessity, a moulting insect remains relatively motionless at this time - easy prey for a hungry bird. And sure enough, we chanced across an insect in the process of moulting during a recent Summer’s night ramble. This one was a katydid - a group of insects that appears in large numbers at this time of the year. You will have certainly heard katydids even if you don’t know what they look like. Males rub their forewings together to produce a sound to which females of the same species respond. A file on one wing is rubbed against a vein on the other wing. The resulting sound is surprisingly loud for such a small insect. Have a listen to this recording I made of katydids calling around our house on a summer’s night a couple of years ago. So what does the creature that makes this racket look like? Here are three species of katydids we’ve seen in our forest. Note that all of these insects have long antennae. This feature alone enables them to be distinguished from one of their relatives, the grasshoppers, which have short antennae. There are several other families of insects in the same group - Orthoptera - as grasshoppers and katydids. The most familiar of these are crickets. 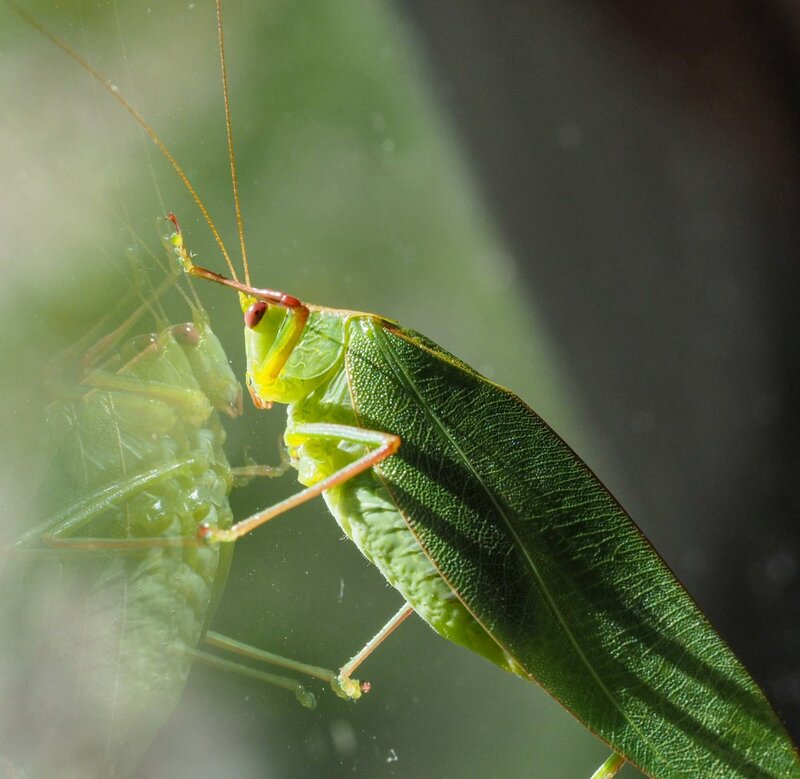 So, how do katydids differ from crickets? The bodies of katydids are laterally compressed (as if someone had placed a hand on either side of the body and pressed them together). Crickets tend to be flattened in the back-belly axis (as if they have been gently trodden on from above). 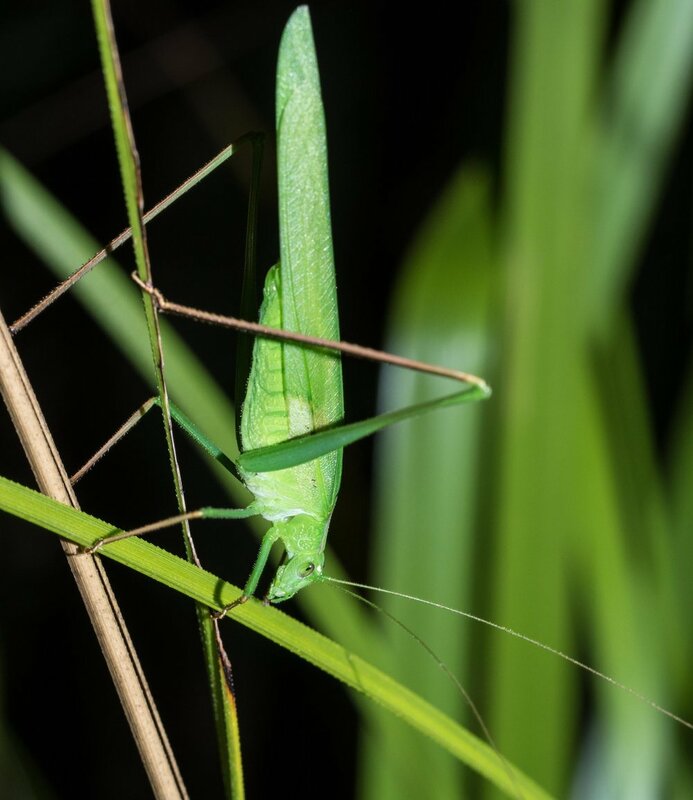 When I first spied the katydid, it was hanging head down, suspended from a blade of Ghania sedge by the claws of its hindlegs. The animal has already pulled its head and most of its body free from its old skin, indicated with an arrow in this image. It achieves this by making regular, synchronised contractions of its body muscles. This increases the pressure of its blood (called haemolymph in insects), creating forces that split the nymphal cuticle open. Now it’s a case of pulling the other bits out. It has almost completely withdrawn its middle pair of legs but the hind pair still have a way to go. You can see them - the long green structures inside the old, transparent skin (cuticle). The antennae too are still partially trapped in their former covering. In the next photo, taken less than a minute later, the katydid has pulled the tips of its hindlegs (arrowed) some distance further down. In order to pull in this direction, it has to bend its femur - the long second leg segment. The asterisk shows this bend. 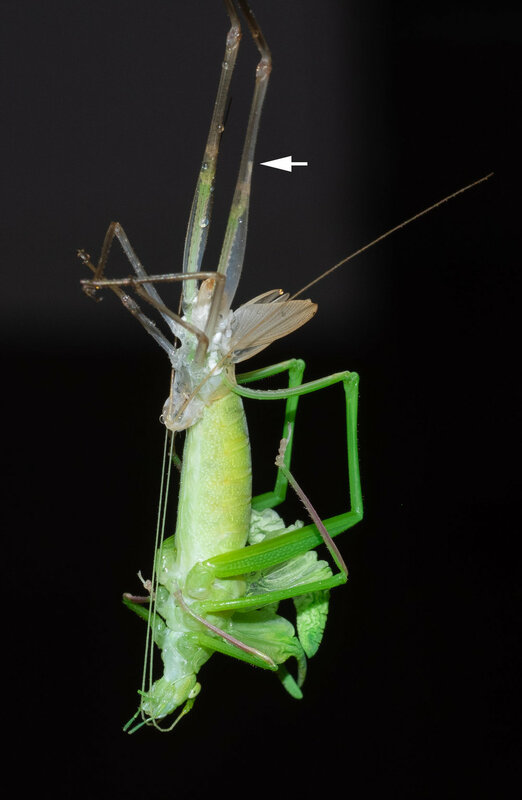 This is possible only because the cuticle covering the body of the katydid is still soft. Normally, bending the femur in this way would snap it. 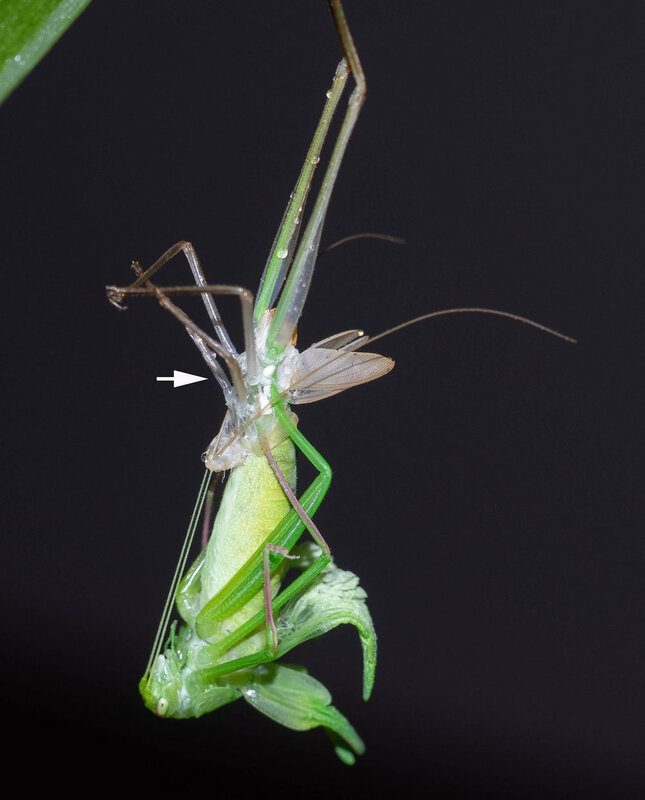 This series of images, taken over an interval of just over 30 seconds, shows the katydid continuing to withdraw its hindlegs from the nymphal cuticle. In each image, the arrow shows the tips of the claws of the hindlegs. In the final photo, the claws on the end of the hindlegs are over halfway down the old femur. The new femur has been completely extracted and the next leg segment, the tibia, is well on the way out. Note how much longer the new femur is than the old one. The crumpled packages on the katydid’s back are its new wings. You can see how much bigger they already are than its old, nymphal wings. And they will get much larger! At this stage, I moved the katydid inside so I could make a movie of the rest of the moulting process - called ecdysis. Watch the movie to see what happens next. The speed of the movie has been increased 8 fold, so the events you see here took place in just over 16 minutes in real time. The next series of still images shows the katydid resting after the exertions of its moult. You can see how much its body has increased in size by comparing it to its old nymphal cuticle. This growth actually took place in the days before the moult. As it grew, the adult body was folded up inside the cuticle of the nymph. Moulting just releases the new body from its confines and allows it to stretch out. The wings are fully inflated now but like the rest of the body covering, they are still quite soft. The new cuticle will harden up over the next hour or so. 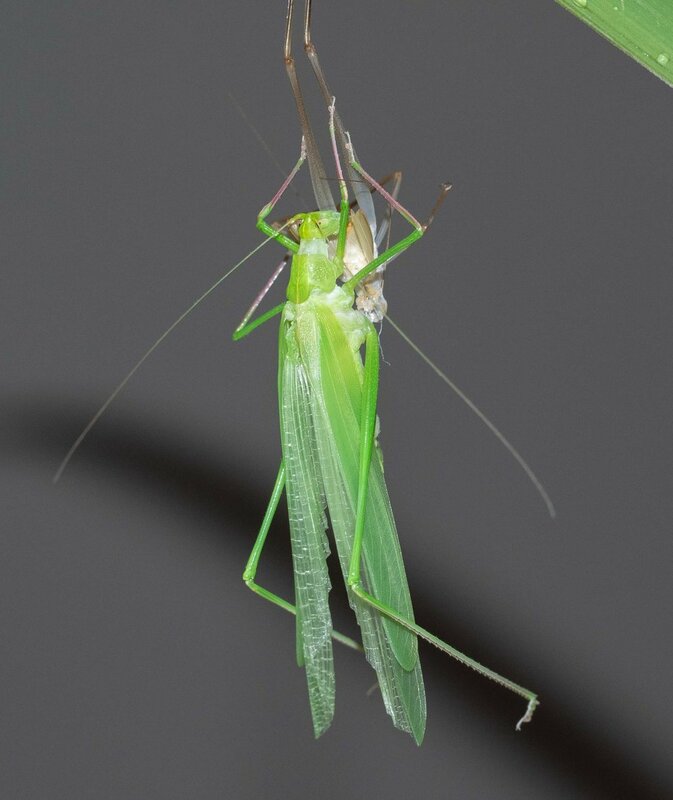 During this time, the katydid will devour its old cuticle - it’s a readily accessible protein-rich snack. We can be reasonably confident of the identity of this new katydid - it’s Polichne parvicauda. And the presence of an ovipositor on its rear end (arrowed) tells us it’s a female. It will hide in the undergrowth during the following day. But come nightfall, it will start feeding. In a short time it will be ready to mate and lay eggs to start the reproductive cycle again. We’ve witnessed the dramatic process of ecdysis on several occasions now. It never fails to delight!